Welcome to our Septmember edition of the FX Junction newsletter. Now that the Summer holidays are behind us and the kids are back to school, August was rather calm regarding economic events, but not on political side as Donald Trump and Kim Jong-un took center stage which helped factor the USD weakening against many of the foreign currencies. It also perhaps fueled traders to begin buying gold and digital currencies. Bitcoins was the market to be long in August as it increased in value almost 60% in August compared to July. In response to this popularity of crypto currencies, retail forex brokers immediately addressed the demands from their clients and capitalized on the volatility of Cryptos by adding Bitcoins and Ethereum CFDs to their MetaTrader platforms in August, among the brokers adding crypto currencies included IC Markets, Hotforex, Avatrade ADS Securities and Admiral Markets. This is great news for social traders because FX Junction is compatible with any instrument traded on MetaTrader, we are looking forward to seeing more crypto currency social trading among our members. How did the community perform in August? We are happy to report that the overall profitability of Live accounts on FX Junction continued to be strong at 55.79%. Needless to say that many of you achieved impressive performance results as displayed on the Find Traders page and Leaderboard. We also seen an increase in new Signal Providers, you can view all the validated signal providers on Find Traders. FX Junction membership continued to grow at a brisk pace as we welcomed 113 net new members. We're happy to see that many of these members linked their MetaTrader accounts and participated on the Dashboard by sharing their trade ideas (don't forget to put # in front of the symbol) and discussing market events. The trading activity in the community was dominated by the usual currency pairs. 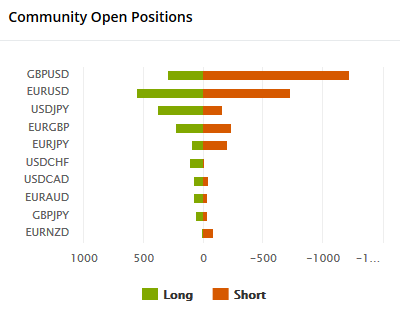 The most oversold symbols (those showing a larger proportion of Shorts vs Longs) were: GBPUSD, EURUSD and EURJPY. The most overbought symbols were: USDJPY, USDCHF and USDCAD. Our newly launched Hosted Connection which makes connecting your MetaTrader accounts to your FX Junction profile easy, continues to grow in popularity among the FX Junction community. Several members shared their comments with us that it has saved them money compared to a VPS and easier to use compared to the self-hosted solution. This is the feedback we were hoping for, thanks!! We recommend everyone to give it a try, we offer a free trial. Total Linked Accounts: The total amount of linked demo and live accounts to FX Junction members. Number of Trades: The total number of trades by members with a linked demo and live account. Trader Profitability: The ratio of linked live accounts that had a total profit in the period. Refer New Members to FX Junction and earn more! It’s more fun to trade together!